With the rise of ALMA, a new and very powerful interferometer in the Chilean desert, things change. In their work, Perez et al. try to assess whether it is now finally possible to probe and image these very early stages of planet formation and get a glimpse of a CPD in action. 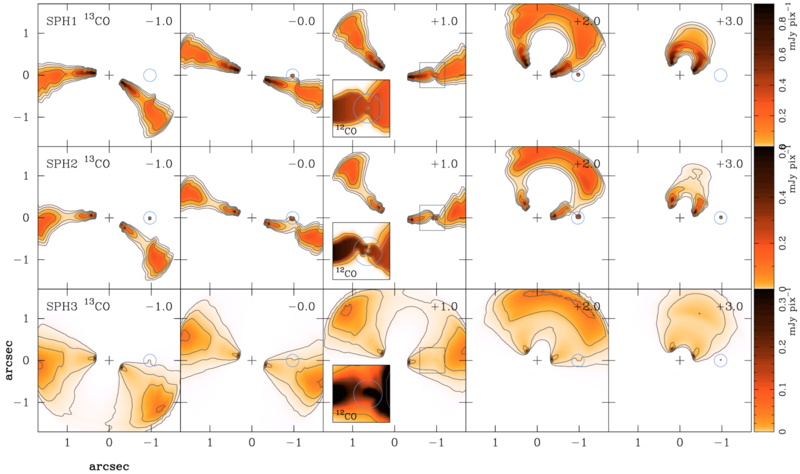 To do so, they run fluid dynamics computer models of the stage of planet formation at which CPDs are expected to form (see Figure 1). The models differ a bit from each other and deliver different answers to the question. The first (SPH1) is a model with a 1 Jupiter mass planet and an extremely high resolution. The second and third (SPH2/3) feature a 5 Jupiter mass planet. Furthermore, SPH1 and SPH2 are using a locally isothermal equation of state. In principle, this means that the gas does not change its temperature at all, which is equivalent to perfect cooling. Physically speaking, this assumes that when the temperature of the gas would rise because of friction or pressure effects, the energy difference is completely and instantaneously radiated away. The SPH3 simulation features an adiabatic assumption, which means that there is no cooling at all and the temperature can rise very much. They use these two extrema (a very cool CPD, isothermal runs, and a very hot CPD, adiabatic run) and from them calculate how this would look like on the sky through a powerful interferometer like ALMA. This is shown in Figure 2. Can you spot it in REAL data? As you can see the SPH2 simulation reveals distinct spots at the position of the CPD. A more thorough analysis of the features of the coolest CPD (SPH2 simulation) reveals that for such a model the signal is clear enough that features like this will pop up in data for 1 and 5 Jupiter mass planets for the current capability of ALMA! Of course, there is still work to do to understand the systematics and uncertainties coming from real data. Anyway, the analysis clearly shows that for good circumstances we are well within the detection limits. So, let’s go out and find it…!